The day off apparently disrupted the universe because I found myself in the wonderful Detroit Institute of the Arts for the entire morning. I’ve visited art museums all over the world, but this one wasn’t on my radar. Thanks to the suggestion of my friend and Michigan native, John Muench, I decided to pay a visit and I was not disappointed. You may recall that there was serious talk of selling off the entire collection during Detroit’s bankruptcy. Proof that there is a god lies in the fact that didn’t happen. The museum is in a splendid building, worthy of a look itself, and has a wide variety in its collection, with some stunning Islamic art, many pieces by African-American artists, several by my favorite, Rembrandt, and a good representation of the European masters. The feature attraction, however, is found in the large central atrium. All four walls of that airy expanse bear murals by Diego Rivera detailing the industrial scenes that highlight the economy of the area. They are dramatic and well suited to the space. 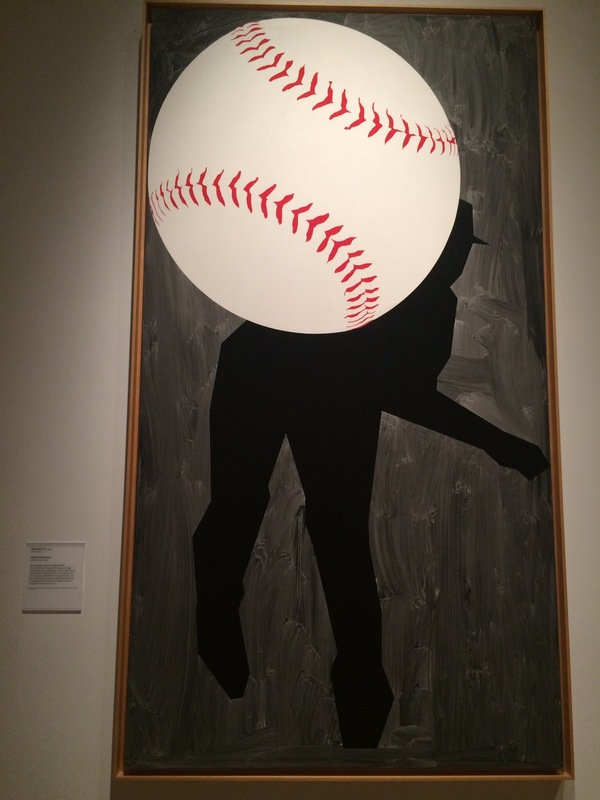 There were also a couple of paintings on our theme – baseball. 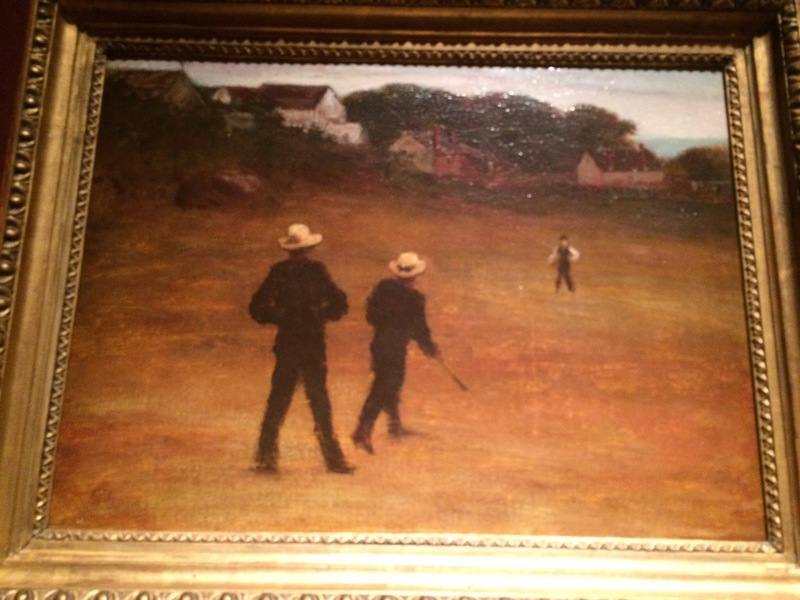 One shows a game in the 1860’s and the other is appropriately titled “Hard Ball.” If you’re anywhere near the area and have even the slightest interest in art, don’t miss this gem. Now to baseball. I was joined for this game by my friends John Muench, in the area for business and family visits, and John Nebel of Seattle, who flew in for a weekend baseball fling. As Muench said, “You can never have too many Johns” (did he mean “johns”?). The Tigers took on the Astros in an important game because both are contending for the wild card in the American League. The Tigers were coming off their sweep of the Red Sox and a good crowd was on hand at Comerica Park for the festivities. 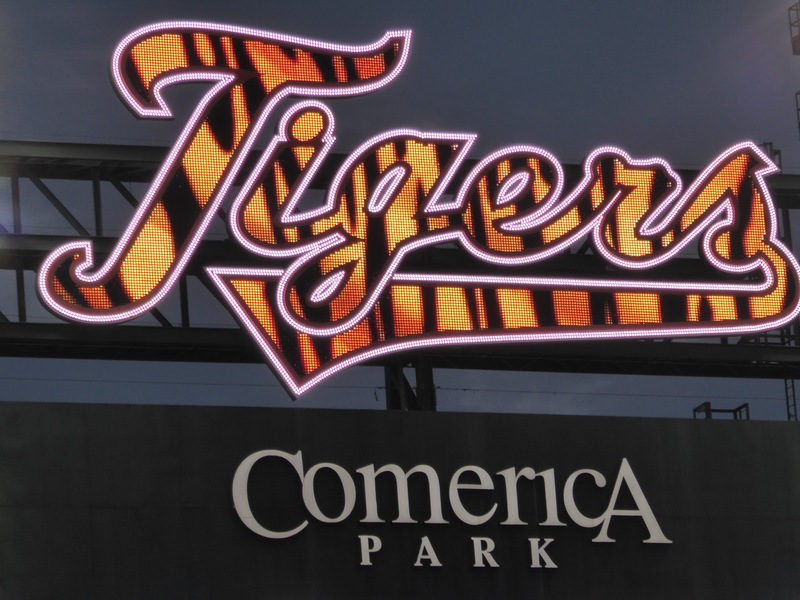 Comerica is named after a Detroit bank that since moved to Dallas. 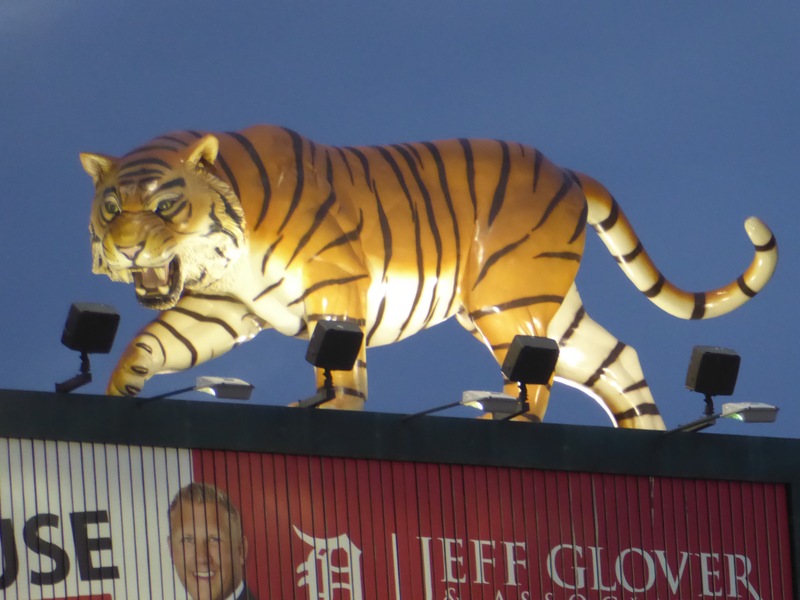 What’s wrong with Tiger Stadium (which natives speak fondly of, but I never had the chance to visit)? The stadium seemed smaller than others on this trip, but actually has a seating capacity over 40,000. It is located, like many, right downtown, and we found easy parking a block away. A pitching duel this was not. The Astros scored two in the first, followed by the Tigers matching them in the bottom of the inning. From then on, it was batting practice. The Tigers chased Astros starter McHugh after one and two-thirds and by the end of that inning it was 9-2 for the Tigers. There were five home runs in the game and four other fly balls to the center field wall that would have been homers in most parks. That point is 420 feet from home, the deepest I’ve seen so far. 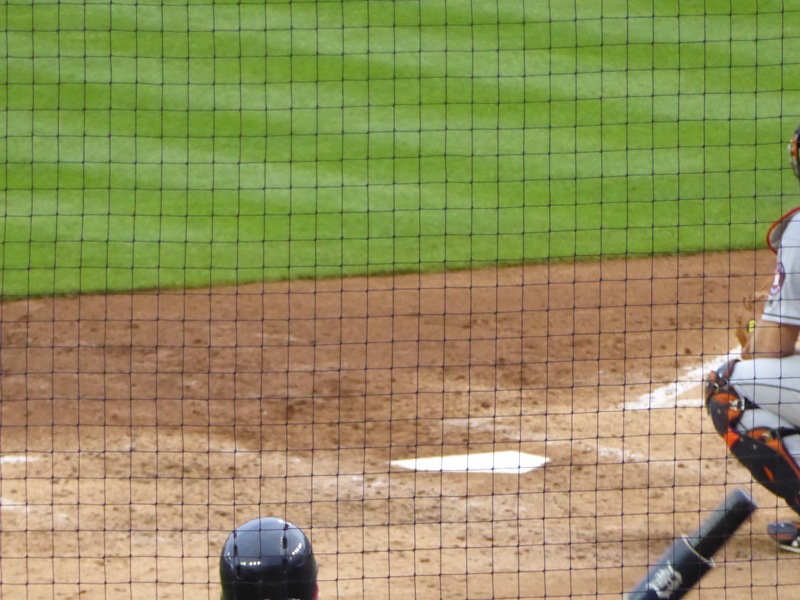 The game also featured three bats that escaped the hitter’s grip on a swing, one of which went into the stands (without apparent injury, fortunately). There were thunderstorms in the area and when we arrived, the tarp covered the infield. Not another rainout! No, no rain, but as you can see, a seriously saturated area in front of home plate. Now there is a long tradition in baseball of the home team grooming the field to its advantage – sloping toward the foul line to cause bunts to go foul, not cutting the grass too short to slow grounders, watering the infield to slow runners, all depending on the opponents’ skills. Drenching the area in front of home might fall into this tradition if an opposing squad was known for hitting lots of choppers, but this was probably just the result of all the water on top of the tarp before game time. And then there’s food. It was not marked by variety or low prices. Standard fare, with only one stand offering unusually topped dogs. I opted for (after some lobbying by one of the workers) an Italian sausage with grilled peppers. It was good, but I later reflected that (essentially) a dog and a beer cost $15 in a big league stadium while the same in Ogden was $5. Also, for the first time on this trip (I know some will find this hard to believe), I had an ice cream cone, and also took the plunge and bought a bag of peanuts (another $5!). Bob, you are getting pretty sophisticated with observations like “airy expanse”! Very nice touch!